Our Lawn Care Program provides the proper blend of nutrients to provide a green, lush, and thick lawn all season long. This program includes a balanced, non-burning lawn fertilization and liquid weed control. We also use an environmentally-friendly, non-phosphorous fertilizer to protect nearby rivers, lakes and streams. Our fertilizer is a unique blend of organic and synthetic fertilizer. 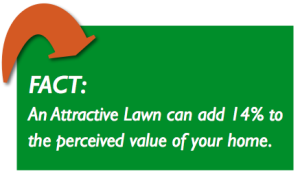 This provides your lawn with iron which gives the grass a rich, dark green color without excessive growth. It also releases slowly and feeds the lawn not by feeding the plants, but by enriching the soil. We also offer a tree and shrub feeding to provide strong, healthy foliage and root development . We pride ourselves in excellent weed control. Prompt spring crabgrass control is especially important to keep pesky crabgrass from appearing in the summer. Our professional weed control also works great on over 60 types of weeds, including difficult weeds like clover and creeping charley. Our weed control is absorbed by the weeds in minutes, so rain and sprinkling will not affect it once it dries. Lawn fertilization and weed control are just part of our complete Lawn Care Services. Make sure to check out our Bee & Spider Control and Merit Grub Control.